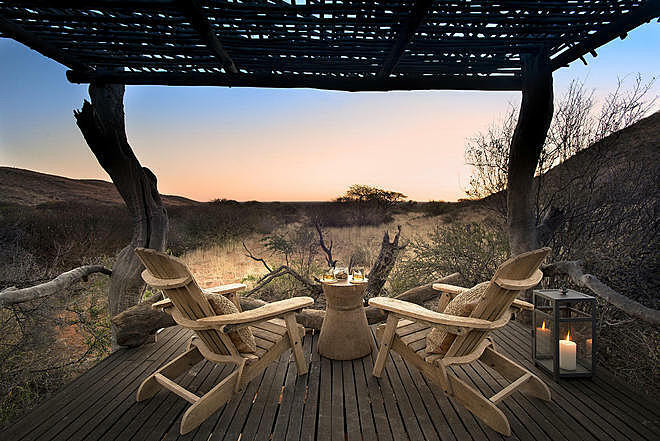 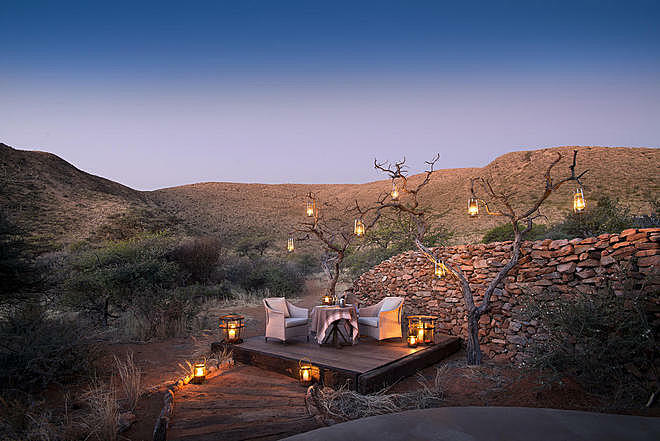 Tsuwalu Tarkuni is an exclusive safari villa nestled amidst southern Kalahari mountain ranges in South Africa’s largest private game reserve. 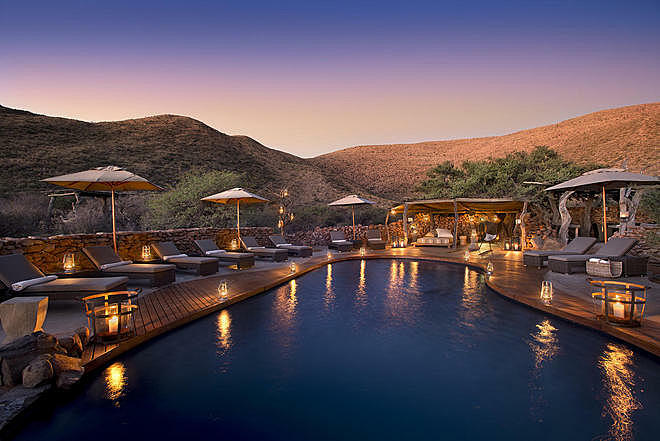 As the private residence of the Oppenheimer family, Tarkuni exudes comfort, class, and intimacy, and is a great place for families with young adventurers or couples seeking romantic sights. 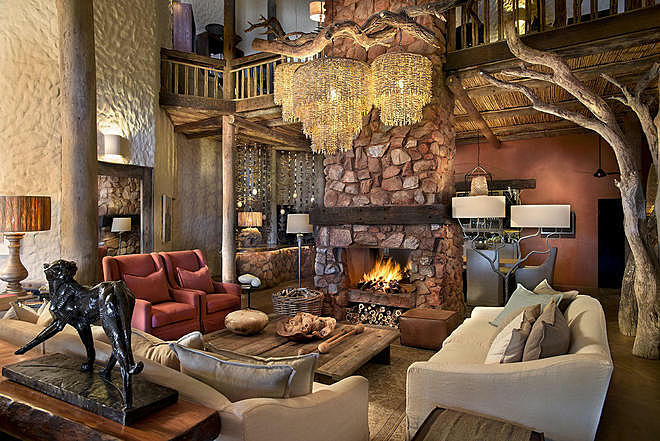 Five resplendent suites are available for up to 10 guests, usually on an exclusive-use basis for groups of family and friends. 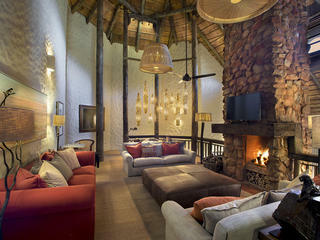 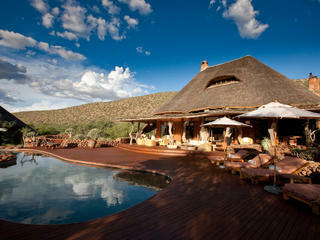 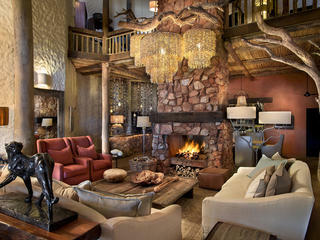 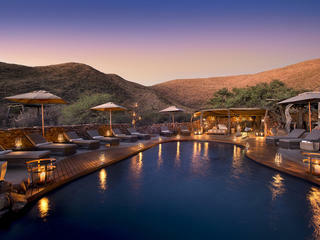 There is also an outdoor pool surrounded by shady salas, two alfresco lounges with open fireplaces, and a private spa. 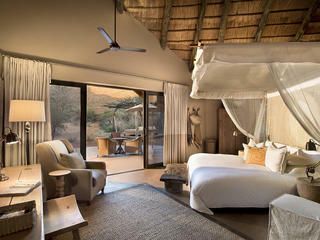 Each suite offers a king-sized bed, which can be set up outdoors on private raised terraces and an en-suite bathroom with both indoor and outdoor showers. 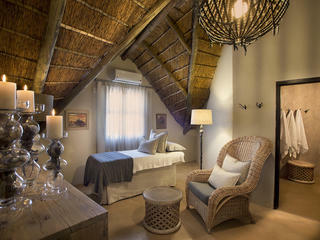 One suite offers a hanging day bed. 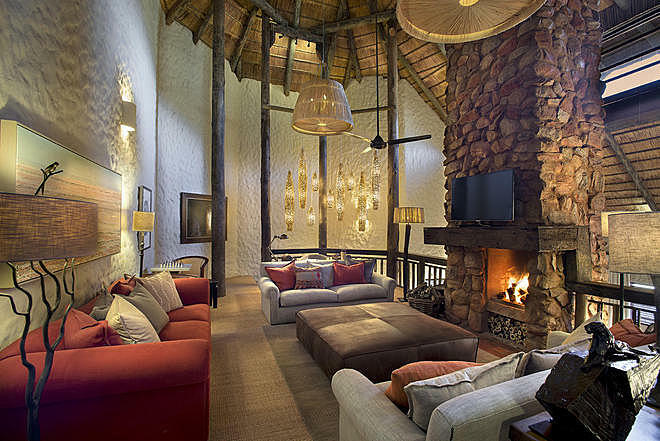 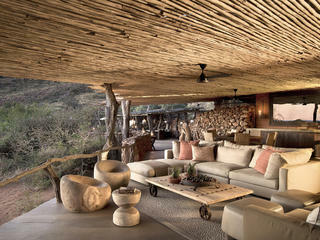 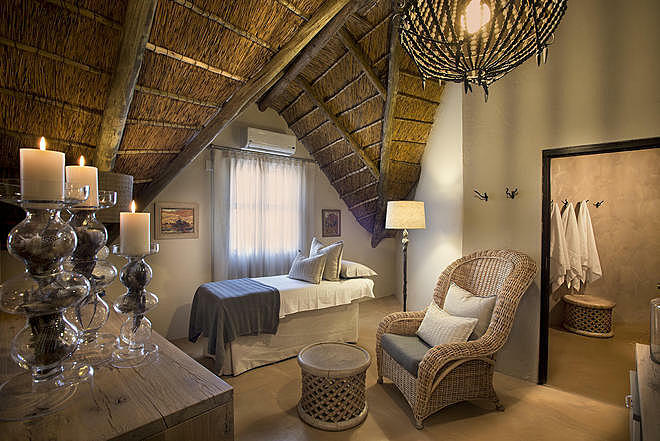 The interior is elegantly decorated with local materials and designs, including traditional Kalahari thatch and Kalahari curtains. 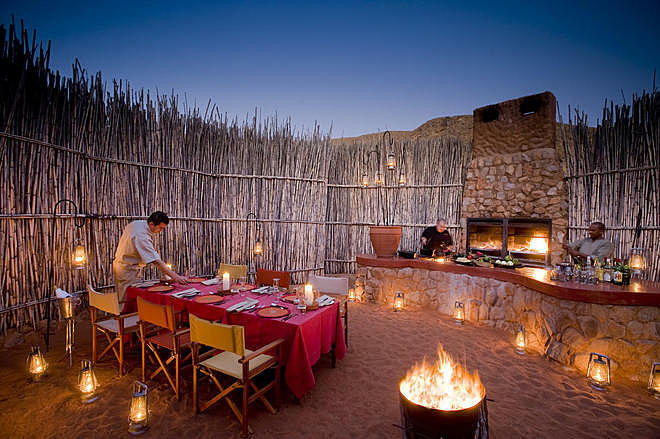 The service guests can expect here is impeccable, with the friendly staff made up of personal hosts, experienced field guides and a dedicated chef. 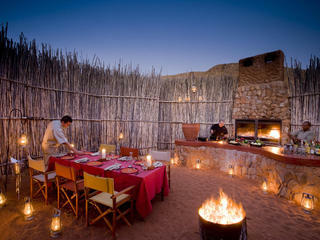 Food here comprises of traditional boma fare, but any meal can be made on request. 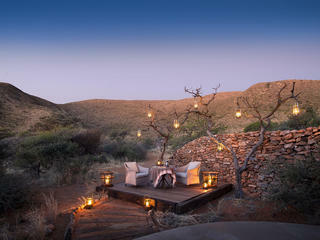 Guests also have all-day access to a gourmet bar and pantry and a full selection from an award-winning list of South African wines. 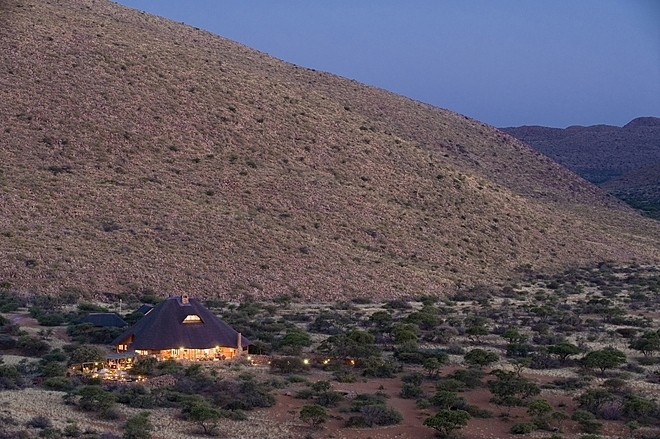 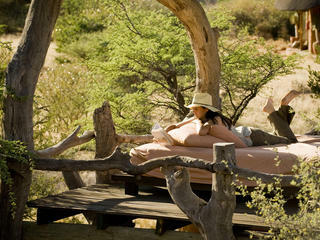 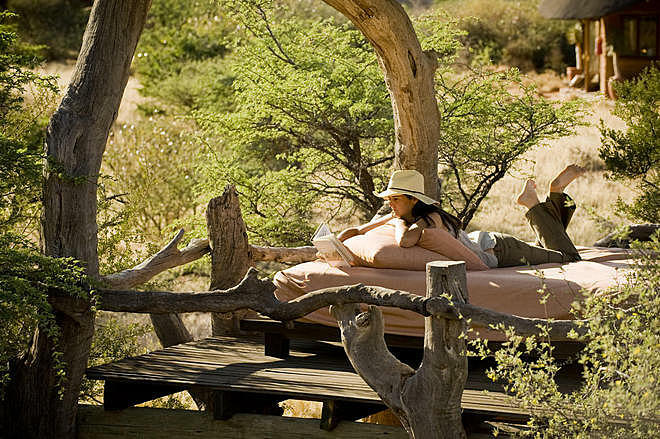 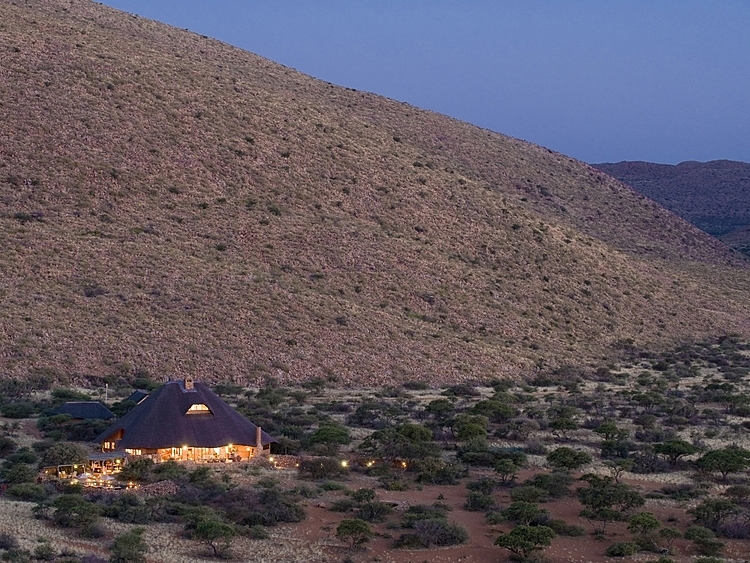 For an upmarket tented camp experience, the Malori star-bed is highly recommended. 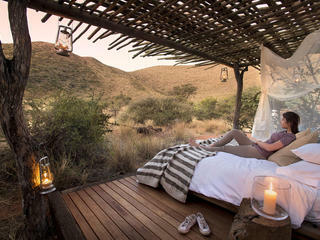 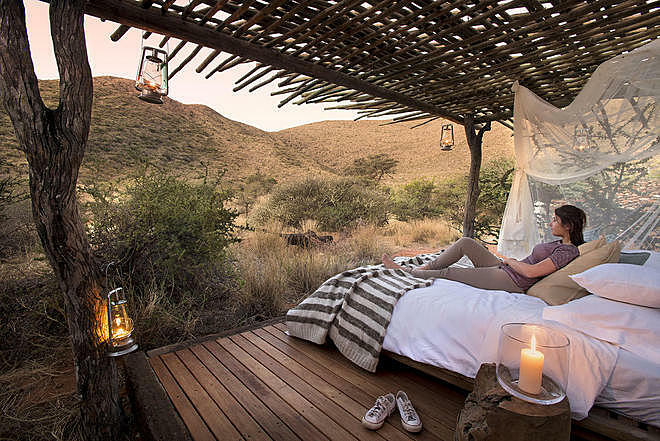 This is a king-sized bed located on an isolated sleep-out deck, for a night directly under magnificent stars in the wilderness. 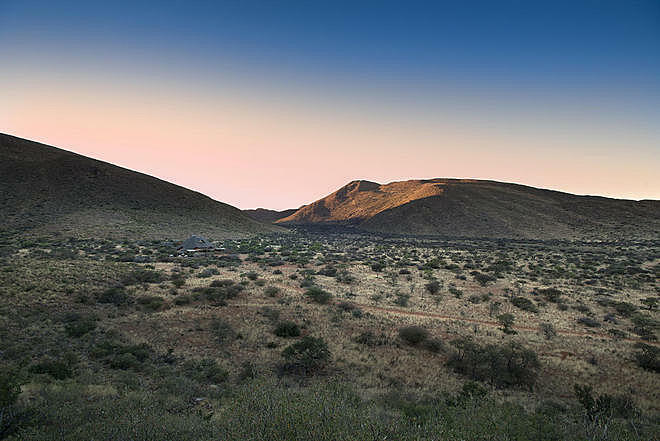 The 250,000-acre of private Tsuwalu reserve makes available sightings of the most elusive species, such as the African wild dog, desert black rhino, aardvark, and pangolin. 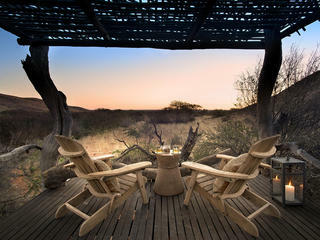 It is also known for a high concentration of plains game, including two colonies of meerkats and the famous black-maned Kalahari lions. 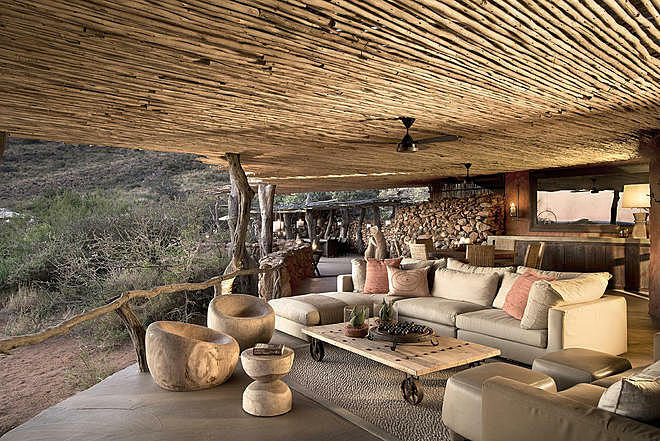 There is a maximum of 10 private vehicles in that vast area, and with its sister camp Motse, a maximum of 30 guests at any one time, which ensures a remote, undisturbed experience. 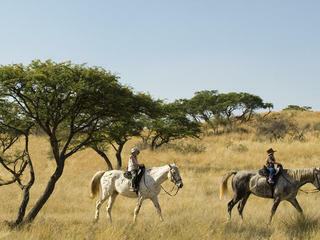 Game drives in open four-by-four vehicles are tailored to each group, with a personal field guide and tracker. 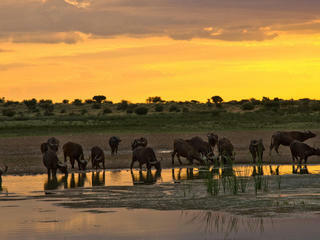 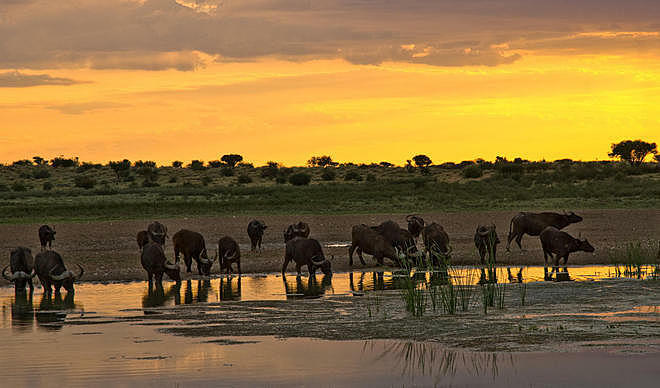 The Kalahari can also be explored on a guided bush walk, including to the rarest archaeological bushman sites, or on a horseback safari. 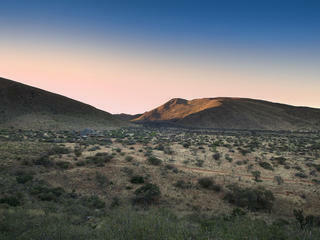 A hot air balloon safari is also possible for additional cost. 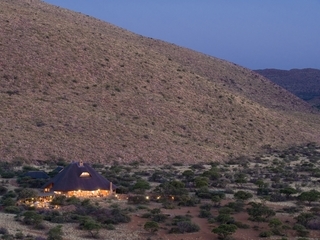 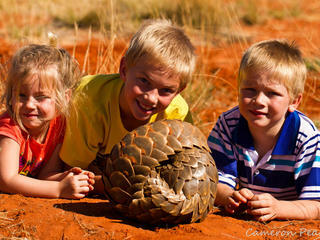 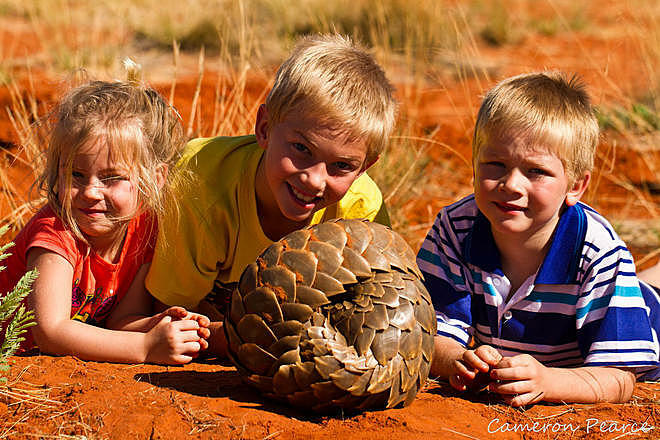 The Tarkuni is especially well-suited for children and families, with child-minding services available, a children’s menu, and activities such as the Children's Junior Ranger programme, where children are given a backpack of guides and tools and are taught archery, spoor identification, casting and tracking. 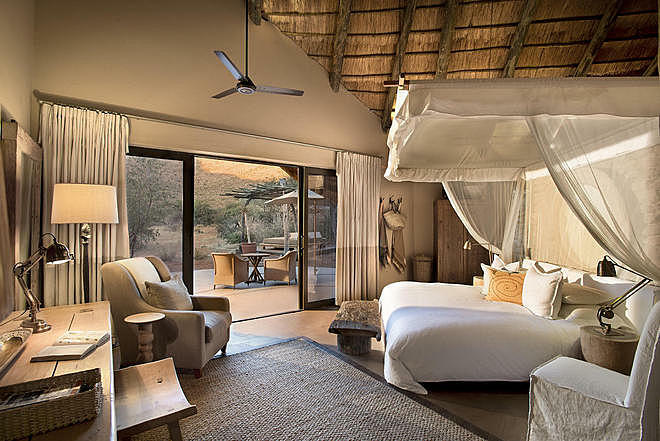 The malaria-free location is a further benefit.